Waking Up in Europe: I'M ON A BOAT! To say ‘waking up’ suggests I actually slept on my overnight flight to Nuremberg (via Calgary and Frankfurt), but of course, I did not. Can anyone actually sleep sitting up? However, I’m not about to complain, because stepping off a plane into a medieval European city is just about the best way to start any day, sleep-deprived or not. Now, why exactly did I wake up in Nuremberg, Germany? Because this was the starting point of an eight-day cruise down the “Romantic Danube” with Viking River Cruises, an itinerary that also brought me to Weltenberg, Regensburg, Passau, Melk, Vienna, and Budapest. Lindsay and I were invited to experience the cruise, but because of some scheduling conflicts, she wasn’t able to make it. While we’d already had a laugh about going on a romantic cruise together (though practically life partners, we are, unfortunately, both still straight), we laughed even harder when we realized I’d be going on my own. What would people make of me? The young Canadian on board a romantic cruise by herself??? Yes, it was sad to venture abroad without my bestest travel buddy, and there were many times I wished Lindsay was sitting in the next chair, watching the countryside pass and belly laughing at my endless stream of witty jokes. However, I ended up meeting so many interesting people on board the Viking Jarl, I completely forgot she even exists! We usually set sail in the evening or over night, and there was plenty of ways to keep entertained on board the ship. 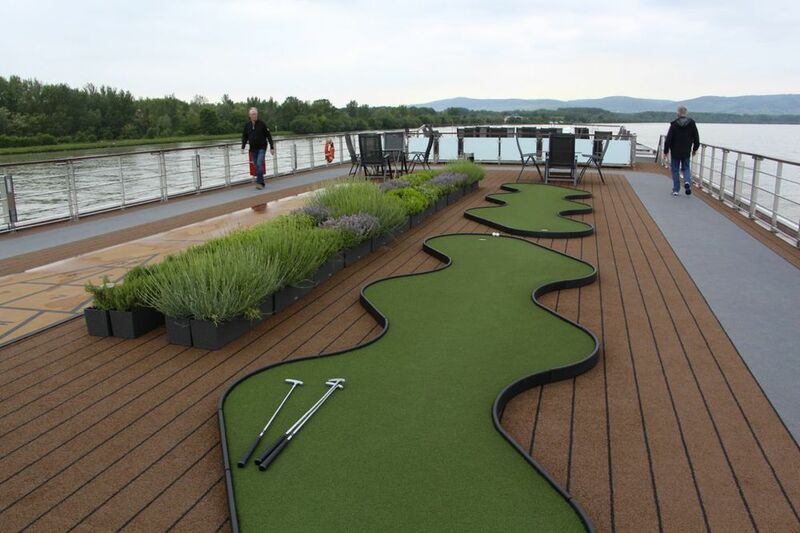 Spanning almost the entire length of the ship was a sun deck equipped with a putting green, plenty of lounge chairs, and even an herb garden! Of course, let’s not forget about the food. There was a ton of it. A number of the dishes on board reflected the cultural cuisines of regions we sailed past, and a team of nine chefs prepared three square meals a day (plus plenty of snacks) for the 200+ people aboard. My brain is still trying to comprehend how it’s possible to complete such a task in a small kitchen ON A BOAT! Then there were all the treats awaiting us in each city…..but more about all that later. FEAST: An Edible Road Trip is going to be a COOKBOOK! After travelling through the night, we docked in Regensburg, and I joined an excursion to the Weltenburg Abbey. It was founded in 620 by Irish monks, and it later become a Benedictine monastery. In 1050 the monks took up brewing beer, and it’s now the oldest continuing monastic brewery in the world. How could I resist credentials like that!? Our second day started with a historical tour of Nuremberg, bringing us through medieval times and the significance of the city during WWII. Nuremberg was a significant centre of Nazi activity before and during WWII, and later became the place where Nazi war criminals were sentenced. After checking into my cozy stateroom, I resisted the urge to pass out for the next 12 hours, and instead took the first shuttle into Nuremberg. Though I felt heavy with jetlag, it was the sunshine, excitement, and abundance of cobblestone that carried me through the rest of the day. YES, it’s true! Between the two of us, we’ll be travelling to four different countries over the next few months. While we love our rich Canadian soil, we've always been game for exploring food cultures outside our borders. And now, thanks to Viking River Cruises, World Nomads, and Intrepid Travel, we’re going international! The day after our lengthy #pastryparkpubpoutinecrawl, we went on a food tour. Yes, we know that’s basically just another crawl with a slightly more refined name, but this time we had an expert leading the charge. If there’s one thing we’ve learned, it’s that when we’re in Montreal, we crawl. After our last Montreal en Lumiere event finished, we got busy planning a route that would bring us to as many recommended spots as possible.